Spot Cool Stuff’s inner child is still very active. Readers have probably noticed that from all our reviews of cool toys and family travel destinations that may appeal equally to adults and kids. So no wonder that we are also fans of playgrounds. 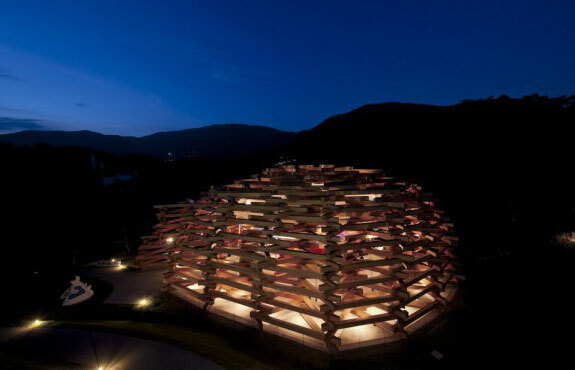 The Timber Pavilion at the Hakone Open Air Museum looks impressive from the outside. (It’s built from 589 huge timber pieces held together without metal parts using ancient temple construction techniques.) But it’s what’s inside the pavilion that we’re concerned with in this article: an enormous climbing net, made from recycled nylon and knitted entirely by hand! The net was designed to create an entire “activity topography.” In other words, there are places to play on various levels. 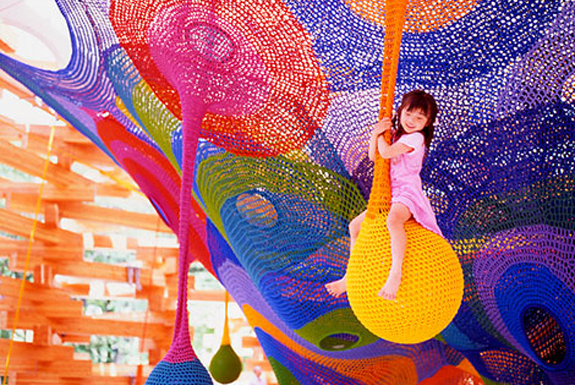 Kids can swing from knitted teardrops on the outside of the net. They can climb around on the top of the net. They can also crawl inside the net via various cubbyhole openings and hang out in tucked-away resting areas. It’s all enough to make the most accomplished spiders envious—and to make the most lax parents wonder whether they will even again see the children who crawl into the net to play. The architectural firm behind the Hakone Pavilion (above) also designed a building of the Tokyo’s Fuji Kindergarten that literally encircles a tree. The tree had been climbed upon and played around by children for as long as anyone could remember. 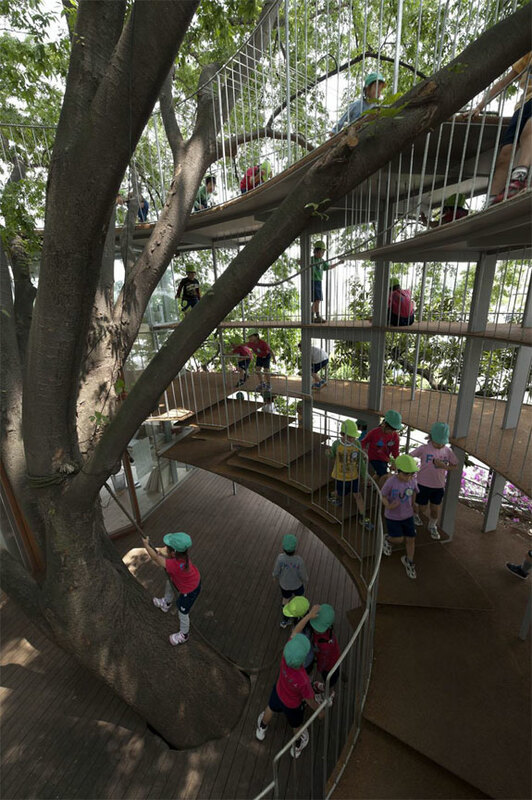 So the architects turned the tree into a playground with swings and rope bridges. It’s very cool, except for the fact that every classroom in the building looks out onto the playing tree, which strikes us as plain cruel. 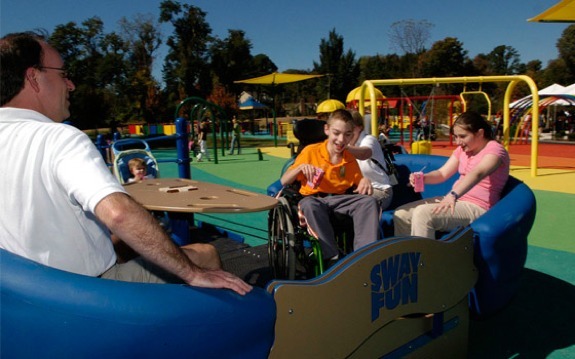 There are lots of playgrounds accessible to children with disabilities. There are very few that offer spectacular play spaces that would equally appeal to non-disabled kids. 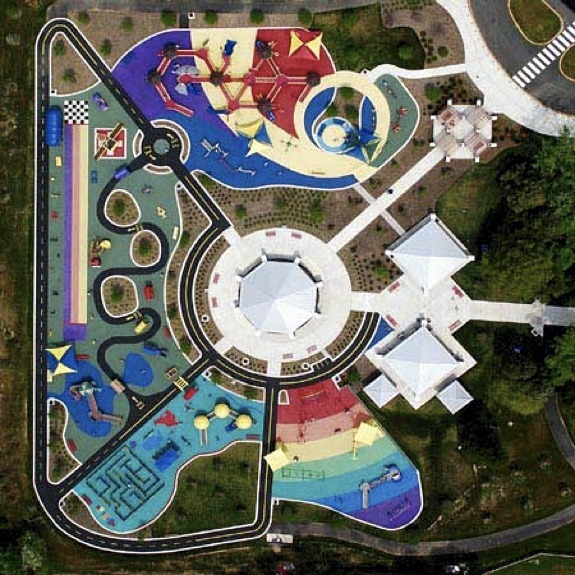 The Clemyjontri Park playground, outside of Washington DC, is one of those special places. What makes Clemyjontri so successful (besides the fact that it sits on a large 18-acre site) is that the designers didn’t settle for un-fun equipment designed to satisfy the lowest common denominator. Instead, they took what makes playgrounds great and invented ways to make that more accessible. The Clemyjontri playground has monkey bars, but they just aren’t as far off the ground as other playgrounds. It has swings, but with high backs and supportive handlebars. The climbing equipment is above a rubberized surface instead of mulch. There’s also a racetrack for kids in wheelchairs, a maze with tactile clues for the blind and a carrousel that everyone can enjoy. The result: kids of all abilities play side-by-side at the Clemyjontri playground. And what on earth could be more cool than that?! 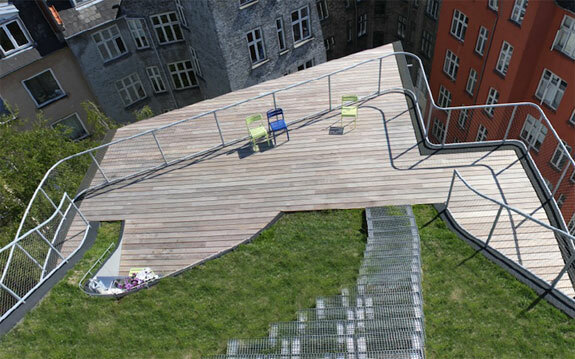 That unspoken rule of the playground—whoever kicks the ball over the fence has to go get it—takes on a whole new meaning at this rooftop play space in the Danish capital. At its center is a grass hill. 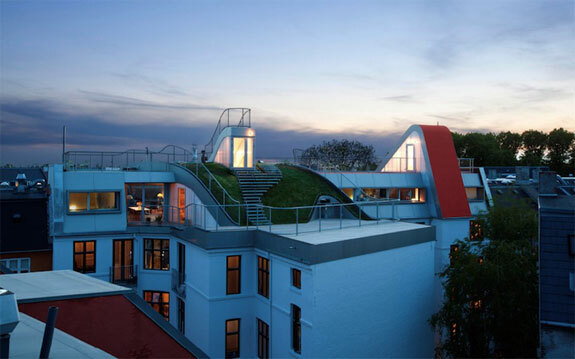 It’s designed to both greenify Copenhagen and minimize the noise impact to those who live in the building’s top floor. Of course, it also adds to the sense that this playground is an accident waiting to happen. Almost every playground in the word features fixed equipment—swings or seesaws or whatever attached firmly to the ground. 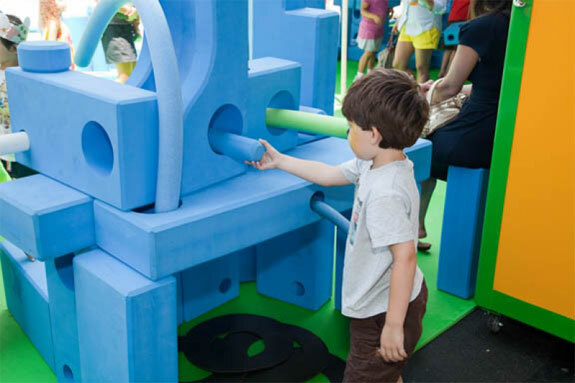 Imagine Playgrounds break the mold by using durable foam ball, mats, ramps, blocks, arches, cylinders, wheels and other objects that can be moved around and arranged in all manner of ways. 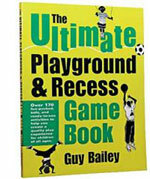 The idea is for kids to bring their own creativity to playground play. 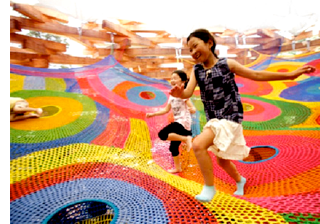 An entire Imagination Playground can be packed up and moved around—one of its major advantages. Of course, the flip side is that adult staff or volunteers are needed to unpack the play stuff and to make sure people don’t run off with pieces of playground equipment. 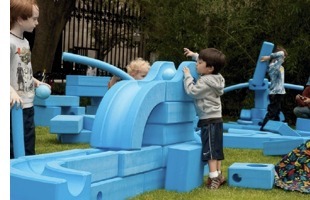 The first permanent location for an Imagination Playground is at Burling Slip in New York City. More are expected around NYC, with other cities (such as San Francisco) inquiring about hosting their own. Not all playgrounds are outside or in public buildings. With enough creativity (and money) a private home can become a playground. As with the Nakameguro House in Japan. 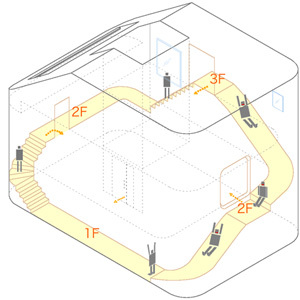 A series of tucked away slides transport residents between the home’s three floors. 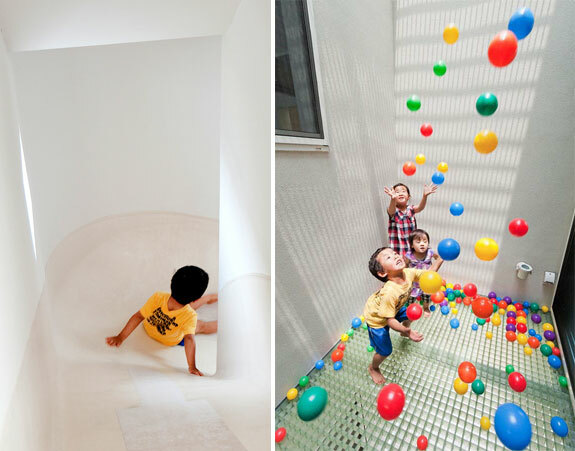 Other kid-friendly spaces include an art room, a bed for jumping up-and-down and a court-yard like area with a natural upwards airflow that’s perfect for throwing plastic balls in (pic, below). 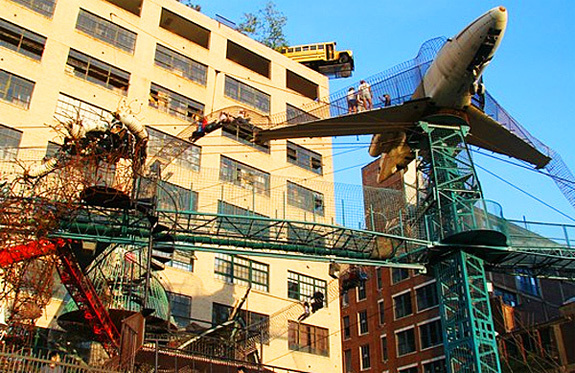 The best is MonstroCity, in the front of the City Museum, is like a jungle gym on steroids. 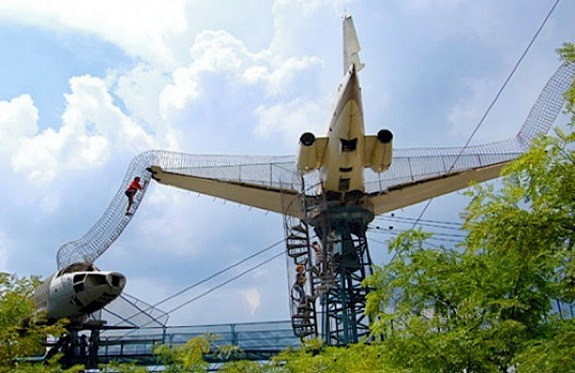 Kids climb on bars and through wire mesh tunnels that connect (among other reclaimed items) two two aircraft fuselages, a fire engine and a building turret! 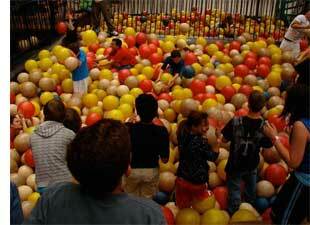 The Baby Bob Ball Pit is a huge vat of plastic balls to jump around in. The name is a misnomer as babies are not allowed in. Sadly, neither are adults. Toddler Town is full of building blocks, gentle slides and mini-tunnels. Except for the couch-filled rest area in back, there’s not much here for adults or older kids. Japan has some awesome playgrounds, love the ring around the tree. I really like wood as a basis for building playgrounds although you see less and less of it now. It’s not on the scale of these but is still pretty nice! We live in Japan and my kids have been to the Hakone Open Air Museum. The playground is as fun as it looks! In general, the playgrounds you find in the local Japanese neighborhood parks aren’t that great–mostly fun only for kids under 10 or so. But there are some really well built playgrounds here and there that all ages can enjoy. wow… this makes me want to be a kid all over again. I like that everything is so colorful – i think that this is how the world look through a child’s eyes.